For everyone who believes fresh, rather than frozen, is always healthier, you might want to ask yourself the following question: How fresh is it, really? If you think about it, any given fresh food item might sit in a grocery store for a couple days. Then, it might go on to wait in your fridge for a few more. You know, until that perfect cooking opportunity comes your way. Although kept properly chilled, which slows aging down substantially, it does not stop the process entirely. Freezing, on the other hand, is like putting that freshly prepared food item in a cold time capsule of sorts, virtually bringing the aging process to a complete halt. When choosing healthy frozen foods, or any food for that matter, it’s all about the ingredients. So, forget about the junk food in the packaged or frozen aisle. There’s plenty of that everywhere, both in and out of the supermarket. Keep in mind that it’s not just how cold the product is, it’s about what’s inside. Therefore, when it comes to healthy items, quality ingredients will always be king. To be sure you’re getting only the best, healthy food products, be sure to check the labels for all the ingredients. If you can only pronounce a couple words on the list, you might want to pass. Also, if that label appears to be written in some kind of a top-secret code… yeah, you might want to pass on that one too. But if you feel you need an advanced science degree, just to break down the chemical equations on the ingredient tag, run! If you want to learn more about serving your party guests quick and easy appetizers, made with only the highest quality ingredients, you’ve definitely come to the right place. Check out these easy frozen appetizers for parties, that will leave your guests speechless. These delicious and healthy frozen appetizers are made with only the finest quality ingredients: lamb, beef, red wine, goat’s milk, extra virgin olive oil, and just the perfect combination of spices. Make sure to save some for your guests! A delicious Greek standard your guests will thank you for serving! Flaky filo dough filled with fresh spinach, feta cheese, parmesan, and pine nuts. This one’s a must serve at every party! You just have to try this appetizer! Filo dough stuffed, full of premium chicken and a delightful mixture of feta, white wine, extra virgin olive oil, and just enough tart lemon juice to push this incredible appetizer over the top. This appetizer has something for everyone. 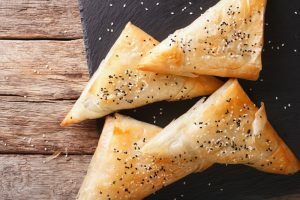 Enjoy a gourmet concoction of fresh eggplant, vine-ripened tomatoes, and artichokes, mixed with feta, parmesan, extra virgin olive oil, and red wine, all stuffed into filo dough triangles. It’s a promise: both you and your guests will be coming back for more! Don’t eat them all before the guests arrive! Feta and ricotta cheese blended with creamy butter and whole eggs, then placed inside flaky filo triangles – what’s not to love about this delicious appetizer? Get-togethers are supposed to be fun, not stressful. So why not simplify your party preparations, pour yourself a glass of wine and enjoy the company of your friends? When serving healthy, easy to prepare, frozen appetizers, made with only the finest ingredients, everyone will enjoy the party. Even you!